“Now also we would not have you ignorant, brethren, about those who fall asleep [in death], that you may not grieve [for them], as the rest do who have no hope [beyond the grave]. This next poem on the subject of life after death as it relates to the hereafter, was written by Connie Hinnen Cook and is being shared with the permission of her widower, Guy Cook. 'Cause there's no weeping there. As they walk in Heaven's land. 'Cause there's no crying here. And joining in the songs. In this land where there's no slumber. There's no grief in this place. One day you'll be together, Yes! What joy your hearts will reap! It's your last chance to weep. Writer, editor and best-selling author Dave Eggers lost both of his parents to cancer when he was just twenty-one years old. He later dropped out of college to become the legal guardian of his 8-year-old brother. Eggers would eventually write a memoir about his parents’ death and the impact it had on his life. The book is titled, A Heartbreaking Work of Staggering Genius. Life after the death of a loved one can be, and is, so very difficult. Much like walking with lead weights strapped to your ankles. Everyday activities that were effortless before, now seem so difficult. Every day becomes another mountain to climb. All the while, you feel so alone. People sympathize, but they don’t really understand – can’t really understand. The funeral is over; sympathy cards are reduced to a trickle. Phone calls become less frequent. Friends and family return to their lives, as they must. But how do those left behind return to their lives. There is life after death, but it will take time. Don’t rush it, and don’t let anyone tell you how you “should” feel. It is your process, not theirs. There are no rules. The following poem was sent to me in an email. It was reportedly written by a woman who was killed in an automobile accident. Her co-workers discovered it in an email when they returned to the office after the funeral. In a recent edition of The Prairie Post, there was a letter to the editor written by a woman whose son had gotten into some trouble. She expressed the deep hurt her family felt upon learning that some people in her community seemed to take pleasure in spreading the news of their unfortunate dilemma. Years ago, Keen and I learned some valuable lessons from an experience we went through as a family. Through that experience, we traded in our idea of having a “picture perfect family” with the more important goal of having a family that exemplifies a “picture-perfect picture” of God’s amazing grace. Now we humbly share our testimony of God’s faithfulness, grace, mercy and guidance. And the smiling faces looking back at you in our family picture are the faces of people who know they are not perfect, just forgiven. That there's really no such thing. We loved them oh so much. With so much to look forward to! Those who know how we feel. With help from God above. Because there's really no such thing. Someone told them the Boogie man lived up there! Whose hands and heart were both cold! If it wasn’t the hogs it was the windmill. He just couldn’t make young Paul mad! In the big open kettle Papa rendered lard. And the pony promptly stepped on Wayne’s ear! In the garden she likes to tarry. She records journeys to places of interest. And you’ll never have to leave your front porch! Note: Alice was born in 1926 on a farm west of Silver Lake, Kansas, located about 3/4 of a mile from the river. When she was 11 days old, they moved into a new house her father had built for the family. When she was four years old, their old home, which was used for storage, caught fire. Alice said that all the neighbors and "half of Silver Lake" showed up with buckets to help put the fire out. Alice's mother helped her Aunt Martha run the hotel in Silver Lake. Martha's husband was named Will Sickles. Since I’ve been trying to keep my columns shorter, I didn’t have room to run all the quotes, verses, poems, and stories that I had saved on the topic of complaining. So I’ve decided to continue with that same theme this week. A century ago, as the numerous wagon trains left Saint Joseph, Missouri, for the trek across the plains already rutted by the tracks of earlier wagons, the eager pioneers read this sobering message on a banner across the western end of the main street: "Choose your rut carefully. You may be in it all the way to California!" 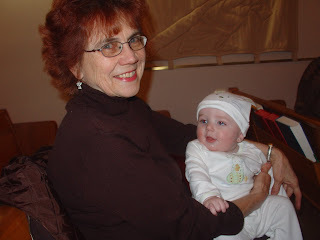 Recently, my friend and fellow poet, Pat Barrett, sent me a copy of her latest poem, titled “Complain or Shine.” With Pat’s permission I would like to share it with you, along with a picture of Pat holding her new little great-grandson, Ian. But what blessings when I obey this demand! Don’t complain when the weather is nasty? When someone is thoughtless and rude? When the driver ahead acts brainless? When I have to pay a “high” price for food?